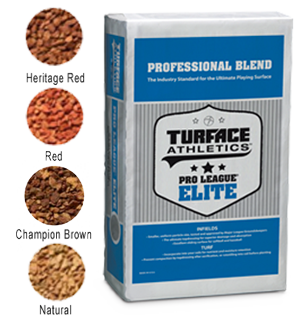 Turface® Pro League® Elite and Turface® Mound Clay® Elite reflect the highest professional standards in quality, performance and lasting satisfaction. Pro League Elite features a tightly screened, uniform mix of particles that are specially designed for the ultimate fielding and sliding surface. Pro League Elite is highly durable on an infield surface while providing outstanding absorption for rainout protection, and preserving an optimum balance of moisture in an infield mix. 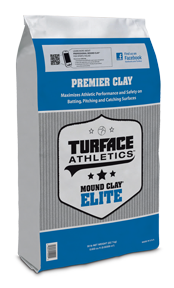 Mound Clay Elite is a premium mound clay that is consistent and easy to use out of the bag. The product is formulated for high durability to stand up to wear at the toughest level of competition. The product is a river clay (gumbo clay) with a high level of tackiness and bonding strength for easy installation and effective long-term use when managed and maintained properly.